When Albert Schweitzer said “Happiness is nothing more than good health and a bad memory” he could not have possibly known how unhappy future Systems Administrators would be when they have a scheduled maintenance window to deploy anti-virus clients throughout the domain, only to realize that the password to log into the console has been forgotten. If this is happening to you, it may provide you some comfort in knowing that I’ve been there, but luckily enough for me (and you, my forgetful friend), there’s a pretty easy way out of a potentially disastrous situation. With that being said, it brings me great pleasure to publish a guide on a topic of which I am so familiar. “Enough about your bad memory! How can I reset my password already? !” You say? Well that depends on which console you’re using. If you’re using SOA, read below. If you’re using EA, click here to jump straight to it. Regardless, be sure to be logged in with administrative privileges, as they will be required. “C:\Program Files\AVAST Software\Administration Console\Avast.Sbc.Service.exe” is the installation path to the file. And –c password –p NewPassword are the application switches. 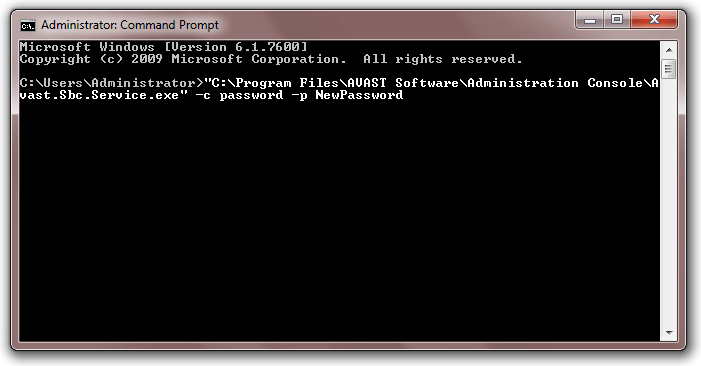 Do leave –c password intact, but change the newpassword field to the password of your choice. If the application cannot be found from its default installation path, simply search for it from the Start menu, and when you’ve found it, right click it and go to properties. 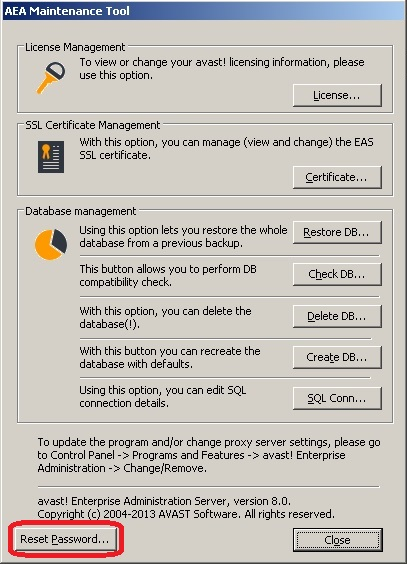 The fields target and location will provide the full path, though you will have to add the file name [Avast.Sbc.Service.exe] and the switches described above to the end. If you have entered the command successfully, you’ll get the confirmation message below. 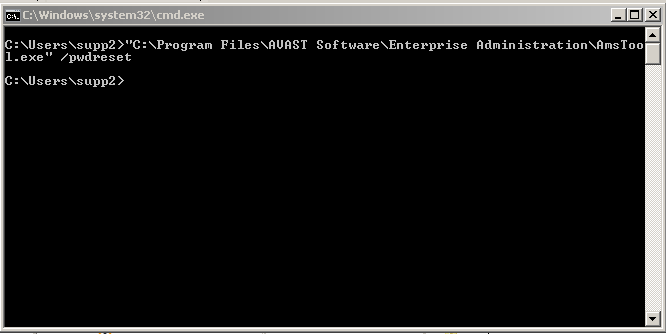 “C:\Program Files\AVAST Software\Enterprise Administration\AmsTool.exe” is the installation path to the file. If you cannot find it, simply search for it from the Start menu, and when you’ve found it, right click it and go to properties. The fields target and location will provide the full path, though you will have to add the file name [Avast.Sbc.Service.exe] and the /pwdreset switch to the end. Once that’s done, the AMS tool will appear, and an option will be available to reset the password.